This month the central theme has been obedience and dependence, and today we add a third, love. I consider these three actions as defining elements in our lives. Two require submission and one action. Love is one of the three things God gave us: Faith, Hope, and Love. We abide in Love through Faith and Hope. Obedience and Dependence are the vehicles in which Faith, Hope, and Love operate. Obedience and dependence do not require outward interaction, they are a state of being. Love, on the other hand, requires a second party and is an action taken. God’s love is eternal and our wellspring. It never dries up, we never have to search for the living water. He loves us and it is our place as Christians to love others. The first step in loving others is loving yourself. The question is, if you are commanded to love your neighbor as you love yourself, how can you love others if you do not love yourself? To love others, you have to first forgive yourself for all your actual and perceived sins that haunt you. Once you have accomplished this and believe you have been forgiven, then and only then can you show God’s truth, which is love, through your actions. It is important to note that, we are not saved through our works, we do not live in the Old Testament dispensation. Through the New Testament, we are new creatures in Christ and live through GRACE. We cannot be saved through this action, we are saved by grace and only grace. The action is only a demonstration of our faith. Further, we should not misinterpret this act as a deed, it manifests itself as action. It is not a work that we do to receive Gods love, it is a gift. God loved us first, and because He loves us, we love others and act to meet their needs. We love others sharing Gods love for us through our actions.We are a branch of His tree. Our actions are demonstrations of God’s love for us. Love is the most important Fruit of the Spirit, Galatians 5:22. Without agape love, Christ-centered love, we cannot show the other Fruit listed. It is through the action of Love that all other Fruit of the Spirit is given life. 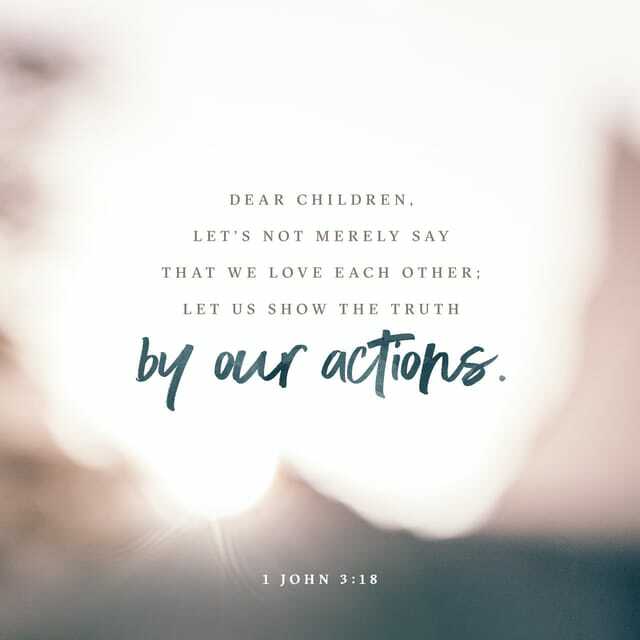 As Christian Warriors we must all strive to love others as an action. This simply means we step out of our comfort zone to assist others in need of help; others can be a co-worker, friend, family member or stranger. I find that when I am nudged by the quiet voice of God, I need to step out of my comfort zone. Take a moment to discover when God nudged you and caused you to pay greater attention to others. We should all become more aware and present in the moment. It is important that during these moments we take immediate action. If we do not take action, i.e. the failure to take action, you will find these moments tend to haunt you. Practice displaying God’s love through your actions. As we do so, we become more Christ-like and mature in the Word as Christian Warriors. You’ll become the person others speak about saying, “I don’t know what it is about Sam, there’s a warmth and caring I sense when I am around him.” This means others are beginning to sense the Holy Spirit dwelling in you. It also is a sign that you are doing God’s work. Love is truth in action! From Verse-by-Verse Commentary, 1 John 3:18, by Grant Richison, June 17, 2001, BibleStudyTools.com. Thank you for spending time on my sites, if you like what you are reading, follow me and receive the daily inspirations in your inbox. My refrigerator has a water filter symbol that changes color to let me know it’s time to change the water filter. Its purpose is to remove toxins and purify our drinking water. As I ventured to the garage to get the replacement filter, God quipped, ‘filters work, write about how you can filter out the voice of the evil one and change in your life’. This could be a figurative process, but my recommendation is to take out your calendars and place a weekly or monthly reminder to evaluate what happened throughout the week or month and how you approached it. It is easier to jot down the day’s events, highlights, good and bad, so at the end of the month, you have a plus/minus chart or checklist. A plus referring to Gods voice and minus to the evil ones’ voice. What are we looking for when evaluating the chart or checklist? We are looking for our level of dependency on the Lord and whether we heard his voice and instructions and acted accordingly. This is a process, but first, we must ask ourselves, do we know how to identify Gods voice because if we cannot, we cannot be obedient. God’s voice, the evil one’s voice, and our own foolish folly. We must become familiar with the Word of God by reading the Bible, and studying the scriptures. Samuel, could not identify the Lords voice the first three times he called him, and Eli told him it was the Lord that had been calling him. He began to recognize the Lords voice over time. The same is true today, we must learn the Lords’s voice through trial and error until it becomes a norm. When God first spoke to Samuel he did not know His voice, he learned to recognize his voice just as the sheep learn to recognize the sheepherders’ voice. Samuel learned to recognize Gods’ voice, and we must learn to do the same. Both the Old and New Testament informs us that our Lord wants to have a relationship with us and to do so, we must learn to hear His voice. This is not as easy as it sounds, it is a process. At times we hear the evil one mimicking the Lord’s voice nudging us to do or say something that is not consistent with the Word of God, and sometimes we follow the flock that does not belong to the Lord. So, the question becomes, how do we know it is Gods’ voice? We know his voice because God will never tell or suggest anything that is not consistent with His Word. This means that when you hear the quiet voice if it is not the Word of God, it is not His voice. If the voice says, call in sick and go with your friends (lying); take the change off the counter, no one will see you (stealing); look at your friends test and copy their answers (cheating); refusing to help a co-worker (lack of gentleness); lying (dishonesty); and gossiping (lack of self-control). * it is the evil one’s voice you are hearing. His commands or suggestions never impart the Fruit of the Spirit or Gods’ laws. We have to learn to identify which voice we are hearing. It is not exactly black or white, there is a third voice, our own, which sends us down a pathway fit for fools. You may ask, how do we avoid the pitfalls? The answer is, we learn His voice by reading the Bible, studying scriptures, researching commentaries, going to Bible Study and discussing the Word with others more mature in how to apply the Word of God in their lives. This is a lifelong process, but like Olympians, we may fall, stumble or fail, but we get back up and correct our weaknesses. Each week or month, recap your experiences that you have written down. How often did you identify the quiet voice as the evil one, how often was it the folly of your own making, and how often was it the quiet voice of God. Applying this process provides you the tools to manage your behavior while eliminating negative behavior. This process is similar to the steps Harm Reduction uses where you identify the attributes you want to maintain as those you want to eliminate. As you are assessing whose voice you are hearing and following, you will begin to quickly acknowledge whose voice it is. If it’s the Lord, you will follow him, if it is another voice you will reject it and move on. And, as you read scriptures in the Bible, you will more readily begin to understand how the Word applies to our daily activities and become stronger Christian Warriors. The voice we follow directs our path. Our goal is to become active in the Word, act obediently, and ultimately become wholly dependent on the Word of God. As we regularly change our filter, we will find fewer toxins existing in our lives. God’s voice will be acknowledged earlier and we will become more dependent upon his love for us. Our relationship blossoms and we become radical Christian Warriors. Note, I mentioned in yesterdays Post that God often speaks to us three times to get our attention, this is another case of speaking three times before Samuel identifies his Voice and acknowledges the Lord. See my Post, From Punishment to Correction and Healing for more about the Fruit of the Spirit.